Note: Not included in the chart is the 2018-19 season where Bowling Green notched 25 wins while Miami had 11. There was plenty of palace intrigue within Cady Arena in Oxford leading up to Blasi’s firing. Conventional wisdom was that original Miami coach and current assistant A.D. Steve Cady was growing increasingly frustrated with Blasi’s lack of recruiting. Blasi’s assistants were beheaded in 2018, the head man guillotined a year later. Bergeron was arguably the sport’s premier recruiter for a decade under Blasi at Miami, loading up Rico’s Redhawks with the necessary firepower to reach consecutive Frozen Fours in 2009 and 2010. The following year, Bergeron and his assistant Barry Schutte moved north and began the rebuilding process at Bowling Green. They never failed to win a post-season series, and racked up 20-win campaigns each of the last five years. The culmination of their efforts was this season’s trip to the NCAA’s, the Falcons’ first in 29 years. Bergeron leaves Bowling Green with an elite class of rising juniors, led by scorers Max Johnson (19-25-44) and Brandon Kruse (10-31-41). The Miami job had been rumored to be Bergeron’s for nearly two weeks when Bowling Green exited the NCAA’s. His comments in 2015, about returning home to Miami, echoed the theme of a classic country western song. “Miami University holds a special place because I’m a graduate. I worked there 10 years and my son was born in Oxford. Anybody who knows me if I said ‘no’ to that, I’d be lying.” His departure from Bowling Green was a fait accompli, and provided the emotional backdrop to his parting words after his last game with the brown and orange. So Team Bergeron points the moving van south after having checked off the biggest box on its ambitious agenda—getting the Falcons back to the national tournamenty. He restored pride in the program and had its most illustrious hockey alums boasting about their alma mater once again: George McPhee, Garry Galley and Mike ‘Doc’ Emrick. There is no shortage of irony in the circumstances of the hiring and firing of Bergeron and Blasi. Blasi and his staff were let go from Miami because they hadn’t done enough on the recruiting front. 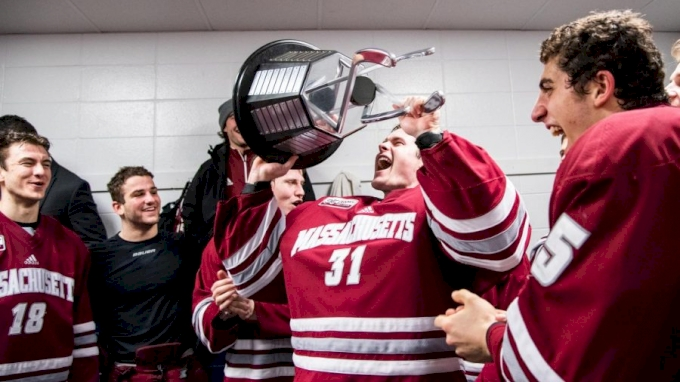 But the fact is, Bergeron is inheriting a full cupboard of prospects at Miami: four RedHawks commits have been selected to the prestigious USA Hockey National Team U-17 squad for 2019-20, tied with Notre Dame for the most in the nation. The task of rebuilding in the most competitive league in America is daunting, and perhaps not the fairy-tale homecoming that Bergeron and Schutte hope for. There is an old adage that could factor into the final analysis: Be careful what you wish for.